Most adult abuse survivors can repeat their stories of childhood trauma and think they know every single character and plot point by heart. We’ll never forget -or more importantly, never let go of- the crucial turning point when everything changed; when the villain closed in; when the “all is lost moment” delivered its crushing blow; or when the finale came and went and we still didn’t feel like the hero. Oh, we know our stories -beat by beat. Blow, by devastating blow. However, what we do not want to learn is the depth and breadth of our devastation. The betrayals we felt from our own flesh and blood and the fact that if we stood up for ourselves -as an adult- we would probably be abandoned and once again, we would be alone and feel even more betrayed! So how do we re-write our story so we are not only the hero, but embody that character fully and forever! First, in order to make permanent and lasting changes, I help my clients integrate what they know (their story) with how they truly feel in their hearts. I help them dig below the surface into their unconscious and connect what they know in their minds with the feelings they have in their hearts and souls, which -by the way- is very different. Therein lies our greatest conflict! So how do we resolve this conflict? This week I’d like to talk about Homework: Right Hand/Left Hand writing assignments as a form of writing therapy. In my individual and group sessions we come up with a topic and then I give them the assignment to go home and write about it using both their dominant and nondominant hand. The purpose of Right Hand/Left Hand writing therapy is to connect the right and left hemispheres of the brain; thereby getting at the truth we didn’t know or want to truly face. Think about it. Writing with your non-dominate hand quickly puts you in a child-like position. Observe any 4 or 5 year old with a crayon. How are they holding the crayon? Is their grip too tight? Too loose? Are the letters perfectly written? Or do they resembles something closer to chicken-scratch? You get the idea. Immediately, we feel like a child and feeling like a child makes you feel more vulnerable. Also, using your non-dominate hand frees up your subconscious so you stop focusing on what you’re actually writing and begin to connect with your most truthful self! Bingo! Feeling vulnerable + Truthful Self = True Healing! 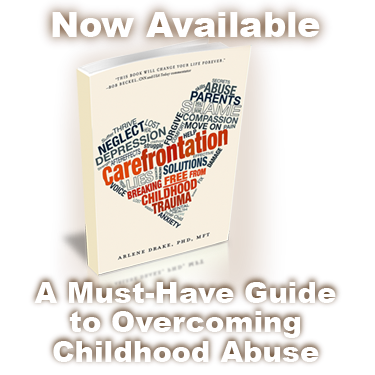 Finally, we (aka the Warriors of Light) learn so we can face the truth and truly heal from childhood abuse. We may not be able to completely change our story, but we can at last go beyond it and live our life fully. We can let go of the legacy of lies that were told to us!